Crossover of a business class is designed for a comfortable transporting of five passengers including the driver. 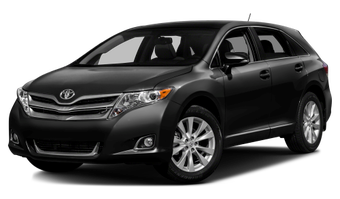 Thus, we offer you Toyota Venza hire in Kiev for business people and young families, who prefer comfortable car trips. “Venza” is created on the basement of a not less popular Camry model. The best engineers of a special Michigan center worked on the technical equipment and design work was fulfilled by the Californian studio Toyota Calty. Daily hire Toyota Venza in Kiev lets you stand out of the crowd of capital drivers. The appearance of the car is a combination of a standard minivan, coupe and a massive crossover. Original creation of Californian designers successfully combines unique characteristics of a compact sedan and functional capacities of an off-roader. With the help of Toyota Venza hire in Kiev you can see the true value of a good aerodynamics and save money through the rational fuel consumption due to the less wind resistance and well-thought exterior. Interior draws attention with the asymmetrical central console. The car can comfortably give place for up to four passengers. Behind the second range of seats, you can transport a big baggage. That is why Toyota Venza rental in Kiev is the best option not only for trips within the city, but also for longer ones (business trips, nature trips, trips to sea etc.). Toyota is equipped with an engine of 2.7 liters with the capacity of 187 h.p., automatic (all-wheel-drive) transmission with 6 steps and different safety systems (stabilizing VSC, antiskid TRAC and ABS). That is why car rental of this model in Kiev is the best solution for a family with children.